The canals offer an unrivalled opportunity for walkers to enjoy their activity in relatively safe and peaceful surroundings. 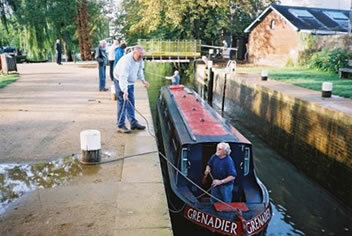 By their very nature the canals are flat, with towpaths on one side of them, and the towpaths follow the route of the canals through towns, villages, green fields and open spaces. All you need is a good map, and a start and finish point with good communications – otherwise you have to re-trace your steps back to the start of your walk! For instance, if you wanted to walk part of the Oxford Canal you could go to Oxford station by train, then walk north to Banbury where there is another rail station with good connections or you can use the buses that take you back to Oxford . While walking along a canal you are never far from a canalside pub for refreshment, nor from a little shop for the purchase of essential items like Mars bars and the like! You also meet all sorts of interesting people, and loads of dog owners of course. 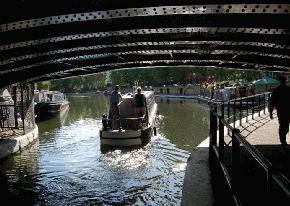 My favourite canals for walking beside are the South Oxford , the Wey Navigation and - above all else - the Regent’s Canal. This latter canal is a delight. It passes through the centre of London and skirts such famous attractions as Regent’s Park and London Zoo. You can gain access to the Regent's Canal towpath at several points, and you are blessed with peace and quiet as you make your way past beautifully decorated houseboats moored along the canal (see scheduled walks), and past terraces of gracious houses built in Georgian and Regency times. Some of these are now owned by famous people such as J K Rowling (the author of the Harry Potter books), Earl Spencer and Michael Flatley of Riverdance fame. 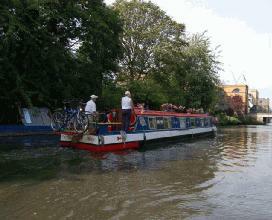 The British Waterways Board issue a whole series of leaflets about the walks along the canals in and around London . They are excellent, and can be obtained from British Waterways Board, 1 Sheldon Square Paddington Central London W2 6TT. Tel No: 020 7985 7200. Or you can visit their own web site which is www.waterscape.com . British Waterways also issue a booklet called “Days Out – A Guide for London and the Surrounding Area” – which gives lots of ideas for walks and days out. Why not check out some of the maps of such canals as the Oxford , the Wey Navigation from Shepperton to Guildford and Godalming, the Kennet and Avon from Reading towards Newbury, or the Regents Canal in any London A-Z map book? Then start planning your walking expedition. Good luck! Let us know how you are getting on! Because of their very nature (being flat), canal towpaths are - in the main - an ideal location for cyclists to indulge in their pastime. Of course, you have to beware of certain dangers especially in built up areas, where some of the locals are not so friendly, and want to indulge in their favourite sport of knocking off cyclists into the canal for a laugh…….But by and large cycling along a canal is a peaceful and delightful way of seeing the scenery and enjoying the countryside. Most cyclists are mindful of the need to look out for pedestrians as they cycle along. You do occasionally get the selfish person who charges through pedestrians at breakneck speed, and who expects everyone to stand aside for him. These selfish types are mercifully in the minority, I find, and a spirit of “live and let live” and give and take prevails most of the time. 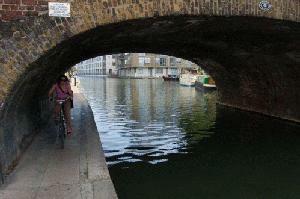 Cyclists also need to be wary of the bridges that span the canals – some of them leave little headroom and you have to duck and dive as you pass beneath them. 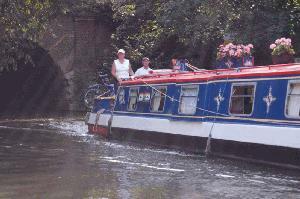 As with walking the towpaths of the canals, cyclists need to plan their routes carefully to ensure that they can make connections with trains and/or their own cars at either end of their chosen routes. Otherwise – as with walkers – cyclists will need to re-trace their steps back to the point where they began from. Occasionally towpaths are not carefully maintained, and they present hazards to cyclists such as pot holes and deep ruts and ridges. Also, not all boat owners moor their boats completely safely. I know of cases where tow-ropes and mooring strakes are positioned across a tow path, thus completely impeding progress by an unwary cyclist, who may be tipped off their bikes and badly injured. But – overall – the cyclist is assured of an enjoyable and safe environment along the canal towpaths to exercise and enjoy their recreational activity. 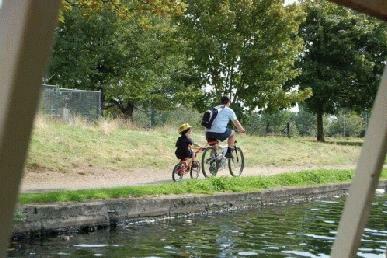 Certainly you will encounter far fewer hazards than if you were to cycle along the roads near the canals, for instance! I hope that this brief introduction to walking and cycling the canals may arourse your interest and that you may try it out for yourself one day!